Over the past four months, the West Harlem community experienced significant hardship after two devastating fires displaced residents and destroyed buildings within distance of each other. On Friday, November 17th, our community was devastated by a six-alarm fire at 565 West 144th Street awhere nearly 90 residents were forced to leave their apartments with only the clothes on their backs and a handful of personal items. On Monday, January 8th, our community was once again devastated by a major fire. This time a seven-alarm blaze on Riverside Drive and 157th Street. Thankfully there were no fatalities, although 67 families were displaced from their homes. 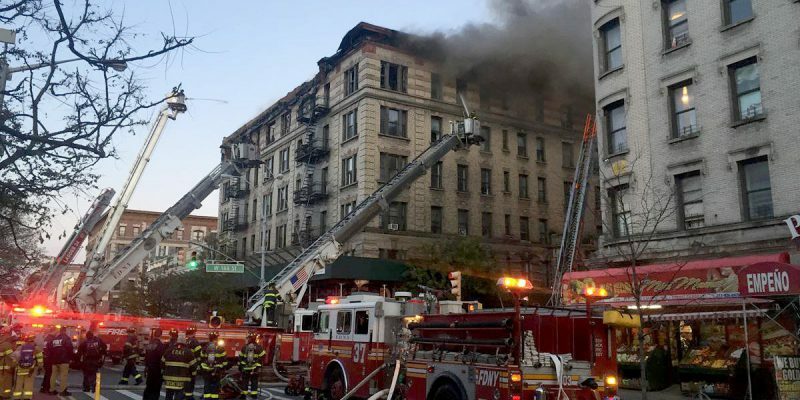 On Friday, February 9th, a fire broke out on the 25th Floor of a Riverside Park Community complex building at 3333 Broadway in Hamilton Heights. Firefighters once again quickly knock out the fire which left several residents displaced from their homes. Those affected by these tragedies are still in need of our community’s full support. As a way to help, WHDC has set up a Community Relief Fund for anyone who would like to give a donation towards relief efforts. Please DONATE and help our neighbors in need. If you can identify the location for your donation, we can allocate your contribution to the all of our families in need at this time. The office of Councilman Mark Levine is also accepting donations of clothing, school supplies, toiletries, and other essential living items to aid the victims of these horrible fires. His district office is located at 500 West 141st Street and open Monday through Friday from 9:30 a.m. to 5:30 p.m., to help you. Should you need assistance, please do not hesitate to stop by, call 212-684-6814, or email district7@council.nyc.gov. We wish to extend our deepest gratitude to hundreds of firefighters, EMS workers, police officers, and American Red Cross volunteers who acted so quickly and bravely. Thanks to their hard work, there were no major injuries, and all displaced families in need have been given temporary shelter. In light of these tragedies, we strongly encourage everyone in our community to visit the FDNY’s website for tips on how to keep our homes and families safe.